Solar Tuk Expedition co-pilot Jack Clark on his way to Noosa. It’s tiny, only has three wheels and a top speed of 50km/hr but a student-built, solar powered tuk tuk has gotten Noosa’s ZEN all worked up. The RMIT student designed and built transport vehicle of the future travelled from Melbourne on a promotional SolarTuk Expedition, and will be making it to Noosa on Monday where it will be greeted with open arms by Deputy Mayor Frank Wilkie and Noosa MP Sandy Bolton. Zero Emissions Noosa (ZEN) are hosting the tuk tuk in town and have organised a green cavalcade of electric bikes and the RACV Nissan Leaf electric car to accompany it as it travels down Hastings Street stopping at The Woods at 10am. The tuk tuk will be known to many locals as a noisy, polluting but popular mode of transport across Asia. A group of university students will accompany their innovative people carrier to show just how they are working on reducing global transport emissions. 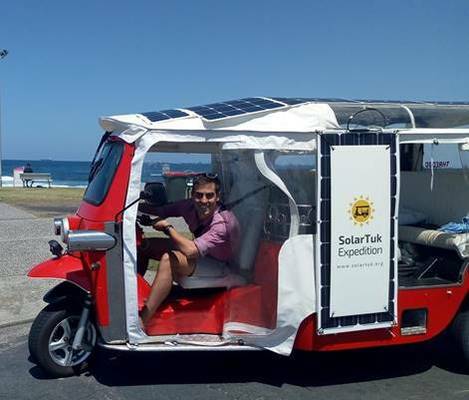 The solar tuk tuk will also pay a visit to Sunshine Beach StatevHigh School to meet with the Year 7 students who have been studying solar power.